This live bald eagle web cam is brought to you by the National Wildlife Federation. This bald eagle pair has successfully raised chicks in this nest for ten years, where they have raised 16-17 chicks. 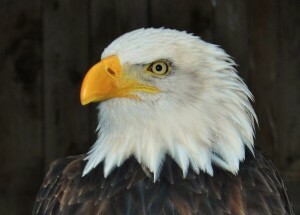 The nest is close to the Atlantic Ocean in Maine, so the eagles eat food from nearby ocean and freshwater environments. Generally bald eagles are scavengers which eat from already dead animals or fish, so this pair would get a lot of food from the ocean shoreline (the intertidal zone). According to the Bald Eaglecam Blog, there are currently two eaglets in the nest. This cam is currently offline, but they have made efforts to restore it. Keep it bookmarked and check back and perhaps it will get back online. FLP Eagle Cam. It’s been awhile since we’ve seen a good Bald Eagle webcam, but it looks like we’ve ran into one today. This one is called Caltrans Eagle Cam and it lets you watch a bald eagle nest live with streaming video in California. This bald eagle cam is visible during daylight hours in California. It may time out after 20 minutes. If so, please reload to continue watching. Watch the Caltrans Bald Eagle Webcam.